There are days when I’m disappointed in who I am as a parent. I raise my voice more than I’d like. I fret over my messy house. I get upset over silly things or lose my patience too easily. I’m really trying hard to not take myself so seriously as a parent. Time goes by so fast. I’m not sure how it is that I have three year olds who go to preschool in the fall. It seems like just yesterday they were infants. I don’t want this time to go by and realize that I was just stressed the whole time they were little. I’ll have tons of time to clean and organize when they get older, I want to enjoy who they are right now. 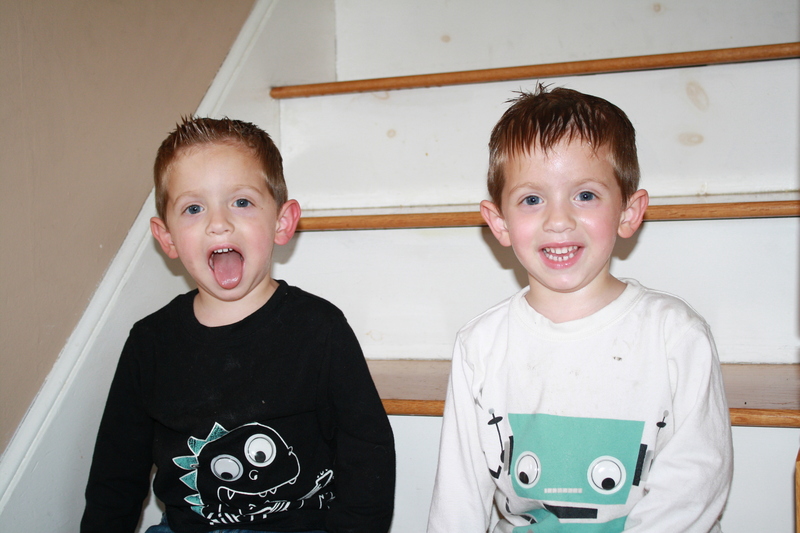 People ask me all the time what it’s like to have twin three year old boys. Well, the truth is, I really don’t know any different. But no one really wants to hear that so I have my typical pat phrases that I use. 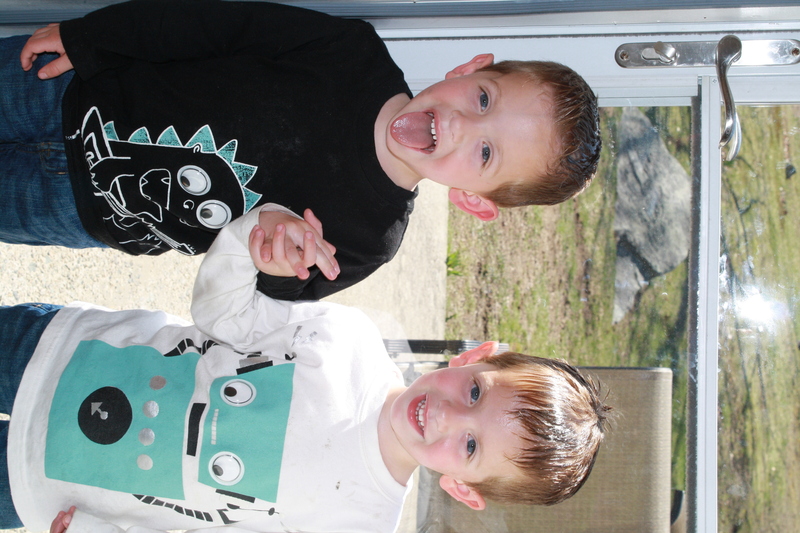 The one I use most often is, “I think if I had one three year old boy, he’d only be half as naughty as one of my boys is.” This is true. Don’t get me wrong, my boys are (for the most part) really good kids. They do listen to me, they are kind hearted, and really loving. But, being the 3 year old boys that they are, they are a bit mischievous. And they enjoy egging each other on. The other afternoon they were in their bedroom napping fooling around. I went in to see what they were up to and was greeted by a powderish smell. Pleasant enough sure, but it made me really suspicious. It wasn’t until I switched on the light that I noticed their hair was covered (I mean completely saturated) with their old diaper cream (essentially powder-smelling Vaseline) that they managed to dig out of one of their drawers. 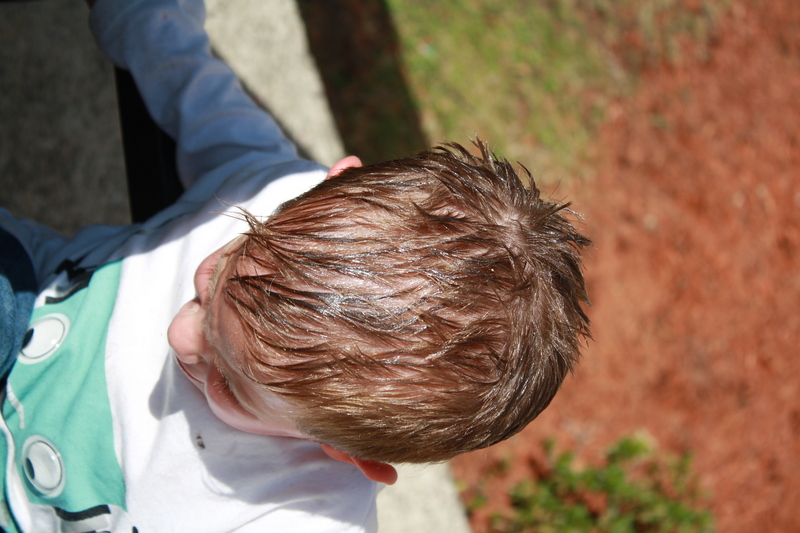 “Look mommy, we put in gel like daddy!” one of them squealed in delight. The other one said “And I made handprints on the wall!” Sure enough one of their newly painted walls was completely smeared with the Vaseline. So, what did I do? Grabbed the camera, set up a photo shoot, and laughed hysterically! For inquiring minds, it takes almost 3 baths and heavy scrubbing with “grown-up” shampoo before water no longer beads on hair, and hot water with soap takes most of it off the walls! In certain lights, I can still see the handprints…and that’s ok. This is too funny! I feel the same way quite a bit of the time. I’m yelling if they aren’t listening, I freak when we might be having house guests and my house is a mess. But I really need to settle down and enjoy the time I have with them, because they truly are growing up way to fast. The story about the vaseline is hysterical, just this morning I was going to get ready, and I walk into the bathroom to find my almost two year old son standing on his stool by the bathroom sink and he says to me, “Mommy I painting”. Sure enough, he made some beautiful artwork with mommy’s makeup all over the sink. Priceless!!!!! So honest. So true. and, so reminding me of a time when my entire bathroom and two wee children were covered in baby powder and diaper cream among other things they found in the closet. It took weeks to clean that mess up. I kept finding more evidence of it. Love it! Your boys are so adorable!